Rain on Your Wedding Day? Southern folklore claims that burying a bottle of bourbon at your wedding venue exactly one month prior to the big day ensures a rain-free event! 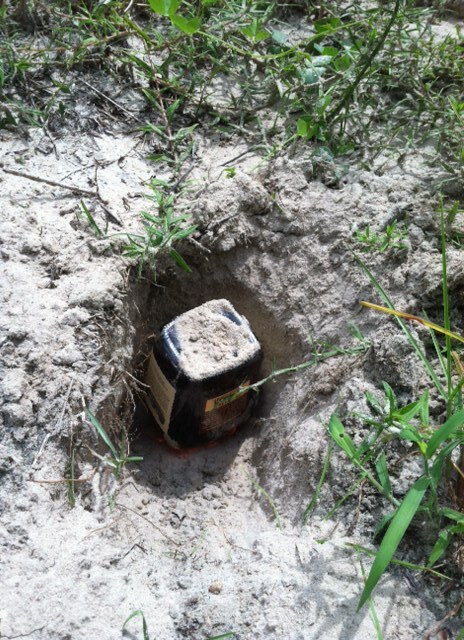 Of course, there are a few details you don’t want to overlook: use a FULL bottle of bourbon; bury the bottle UPSIDE-DOWN; and be sure to MARK your burial site so you can enjoy the bourbon later on. Now, I’m sure you are all asking the same question – DOES IT WORK? Speaking from personal experience, I’d have to answer, YES! We recently buried a bottle of Maker’s Mark (our bride was from Kentucky) at the wedding venue exactly one month prior to her wedding day and though the forecast called for a 40 percent chance of rain, the weather for the outdoor ceremony and cocktail hour was absolutely beautiful. At 7:45 pm we moved the party inside to the ballroom for dinner and dancing. Exactly two minutes after the last person walked through the ballroom doors, the skies opened up and the rain poured down. Pure luck or a little Southern divine intervention? I’d say a little of both. 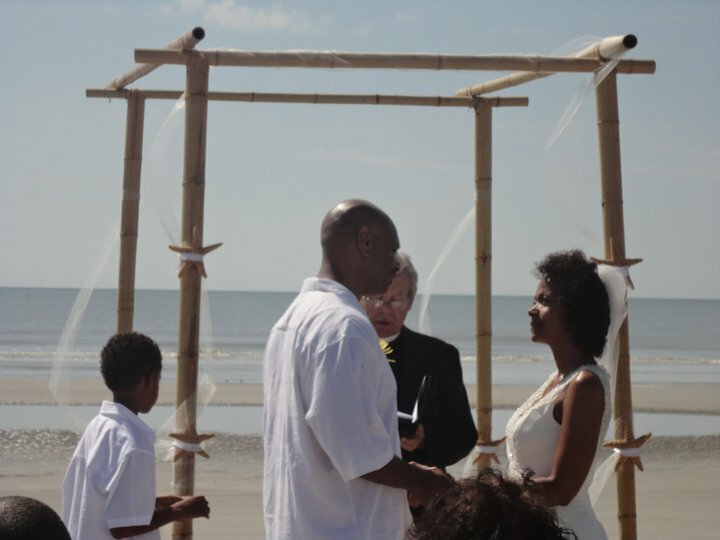 When she first called our office, bride-to-be Kali of Charlotte, North Carolina was looking for help with just a few things. She wasn’t looking for someone to manage every aspect of her wedding, she only needed assistance securing a venue and locating vendors that fit her needs and her budget. Kali was referred to us by one of the amazing brides we had the pleasure of working with over the summer so we couldn’t wait to get started! We met Kali and her mother on a Sunday afternoon and spent the next two days discussing vendors, visiting venues, and looking at different accommodations. 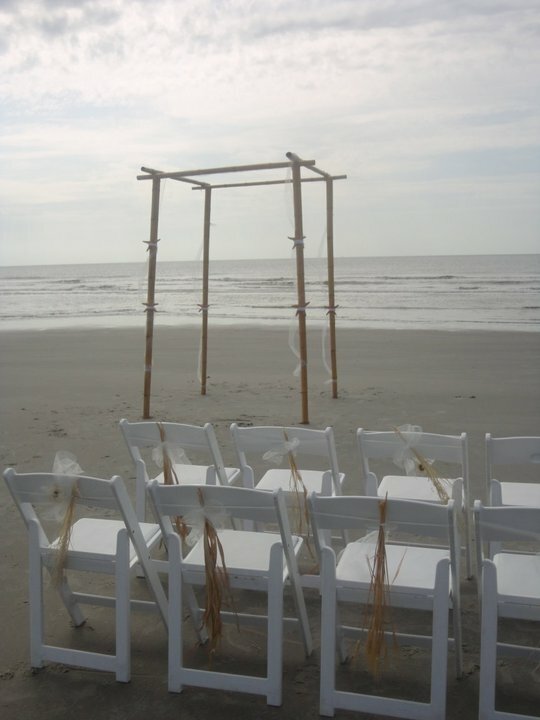 In the end, Kali selected the Harbour Town Yacht Club as the ceremony and reception site and secured a discounted rate at the beautiful Crowne Plaza Hotel in Shipyard Plantation for her out-of-town guests. She also walked away with a list of recommended vendors who fit her specific price point. 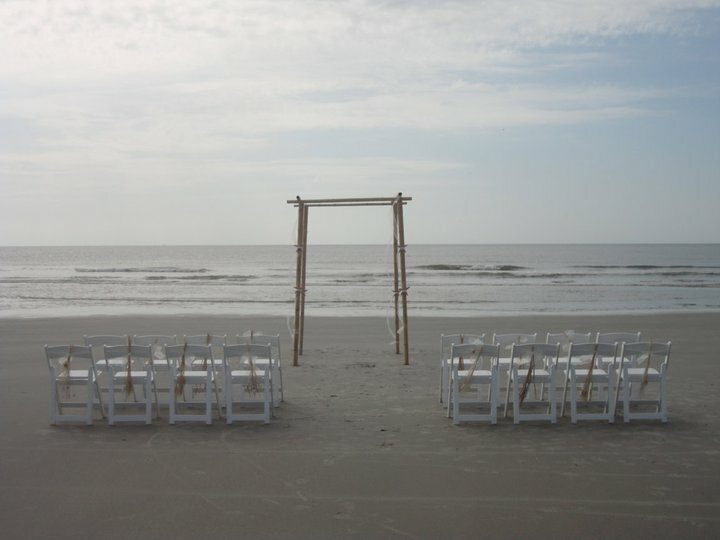 If you are planning a wedding on Hilton Head Island or the surrounding lowcountry and need help with “just a few things”, please do not hesitate to contact us. We are more than happy to help. 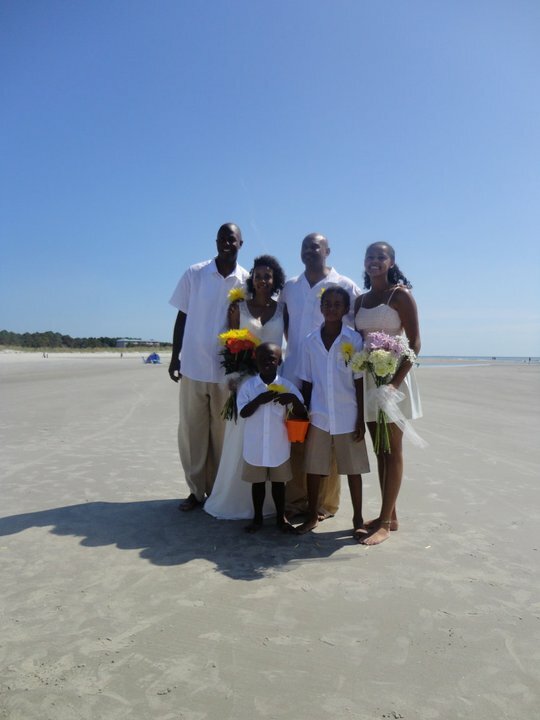 Tiffany and Brian of Charlotte, NC exchanged vows this past August at Singleton Beach under a clear blue South Carolina sky. Family and friends gathered for the celebration which was officiated by Revered David Leininger. 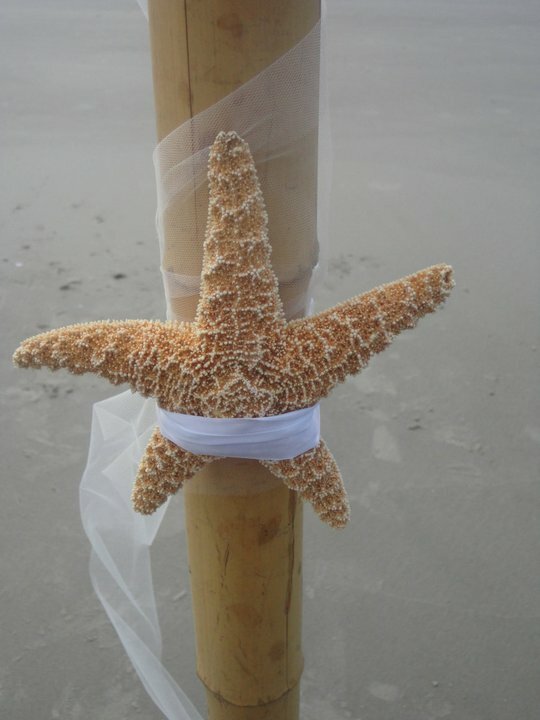 The couple stood beneath a bamboo arbor decorated with tulle and starfish while their guests sat in chairs adorned with seagrass. 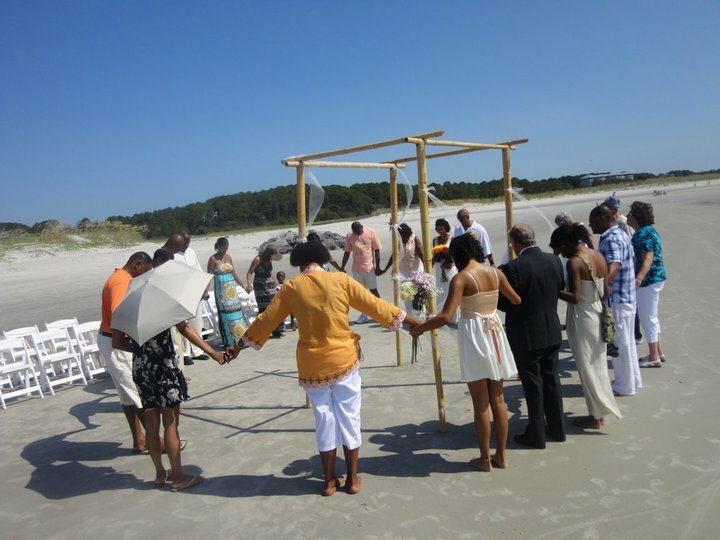 After saying “I do”, they asked all their guests to join them in a prayer circle as Reverend David offered a special blessing for the newlyweds. 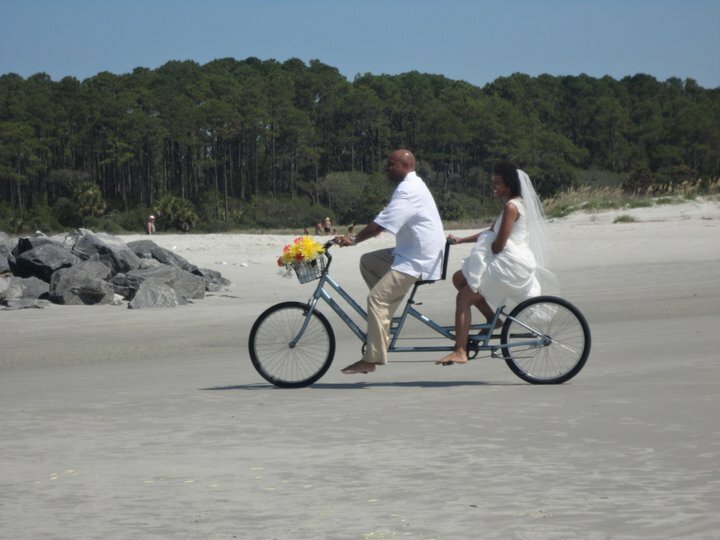 Once the pictures were taken, the bride and groom hopped on a bicycle built for two and took off for a scenic ride down the beach. Guests later joined the couple at their home in the Village at Singleton Beach for a reception. 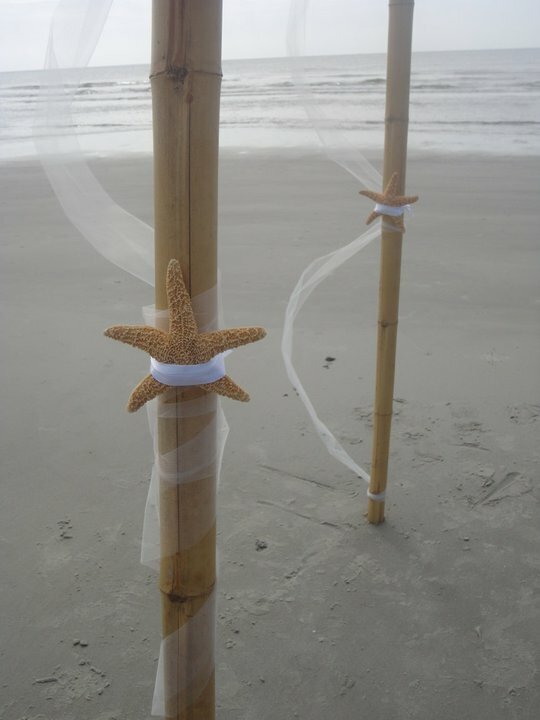 We spent Saturday afternoon on Adler Lane Beach celebrating the union of Bobby & Erin from Flowery Branch, Georgia. Carl Schroeder of Weddings By The Sea officiated the ceremony and Meredith Barouth from Island Love Photography captured the memories that will last a lifetime. 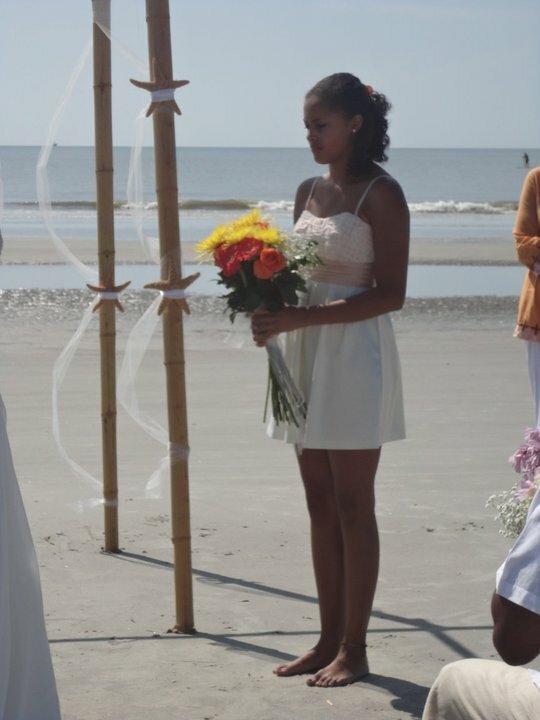 Upon arriving at the ceremony, guests were invited to join the bride and groom barefoot on the beach and, later, signed seashells in place of a guest book. After the ceremony, guests joined the happy couple for dinner at a local restaurant. Let’s face it, it is very easy for your flower budget to spiral out of control very quickly. One quick and easy way to keep your flower budget in check is to use flowers that are in season at the time of your wedding. And of course, those beautiful autumn leaves. No wedding is complete without a means to get you to the church (or the venue) on time but brides today are looking beyond the traditional limousine. Trolleys – Grab your wedding party and hop on a trolley. The photos are sure to be fantastic and a great time will be had by all. Segways – Make an entrance no one is sure to forget with one of these self-balancing, zero emissions personal transportation vehicles. Golf Carts – Whether it’s a cart for two or one that seats eight, nothing is better than a parade of decorated golf carts. Boats – Does your venue have a water view? Take advantage of the opportunity and arrive by boat! Horse & Carriage – Have your Cinderella moment without traveling to Walt Disney World or just channel your inner Kate Middleton, many stables provide wedding transportation upon request. Classic Cars – Transport your wedding party in style with a fleet of classic cars. Check out local car clubs for owners who might be interested in working with you. In the end, your wedding transportation options are really only limited by your imagination so don’t be afraid to dream big! Happy planning!